Tomorrow marks the feast day of Saint Raphael of Brooklyn. He was born in Beirut, Lebanon to Syrian refugee parents, and his route to America was somewhat circuitous in that he spent some time in Russia prior to being sent here -- by Czar Nicholas, II -- in 1895 in order to minister to the local Syrian Orthodox communities. 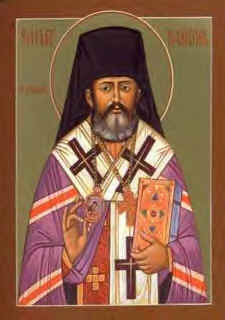 In 1904 he became the first Orthodox bishop to be consecrated in North America. He was bishop of Brooklyn, New York until his death on February 27, 1915. He was glorified by the Holy Synod of the Orthodox Church in America in March of 2000, and is commemorated by the Church of Antioch on the first Saturday in November. Today the memory of blessed Raphael hath shone on us; For having received Christ’s call, he faithfully took up his cross and followed Him becoming a fisher of men. Let us cry aloud to him saying: Rejoice O Father Raphael!